Imagine trying to learn how to drive a car while taking your driver’s test. That is essentially the challenge that Wayne Simmonds and Brian Boyle faced when they both joined the Nashville Predators earlier this year: learn how to play in a new system with new teammates and coaches while playing in meaningful games in the most important part of the regular season. 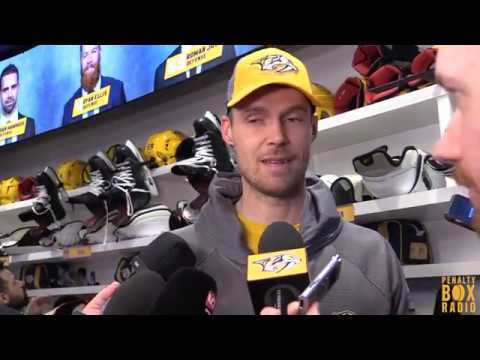 When Boyle joined the squad on February 6, he seemed to click fairly quickly with the Predators. After Simmonds was acquired at the deadline on February 25, it’s taken him basically the full month since then to find the right chemistry with his teammates. Things might be turning a corner for him, however, as he scored a third-period goal in a 3-0 Predators win over the Toronto Maple Leafs. The work on-the-fly to gel with his teammates has started to pay off. Simmonds’ goal was one that required a lot of chemistry. Defenseman Ryan Ellis made a move down the wing and made a split-second decision to fire a pass across the net to Simmonds waiting on the other side to tap the puck home. It was the type of play that only happens when the players have figured out each other’s tendencies. Boyle’s first period goal was no different. Ryan Johansen laid a pass across the ice off of a turnover, and Boyle ran a perfect give-and-go with Craig Smith before burying a slapshot. Boyle and Smith needed to know where they were going to be and who wanted to shoot the puck. Their well-developed chemistry allowed them to do just that. In Boyle’s experience, adapting to a new system of play is just as important as adapting to the teammates around him on a new team. With the new guys clicking and firing on all cylinders, the Predators have now won three in a row with eight games remaining before the Stanley Cup Playoffs. If there was ever a time for Head Coach Peter Laviolette’s squad to get it together, it’s right now. The Predators face a pair of tough tests down the stretch as they take on the Pittsburgh Penguins at home on Thursday followed by a trip to Winnipeg to take on the Jets on Saturday.